Applications : Schools, Colleges, Education institutes, coaching institutes etc. Use full : System fully relieves the person responsible to ring bell at accurate time. It is fully automatic. a. APNB model system rings bell once for period No.01, Twice for period No.02 and so on. For assemble, interval and school off single shot long bell is rung. So with this you can distinct the period number. b. APB Model bell rings single shot once only. User can set the ringing duration between 01 to 99 seconds. Time accuracy is maintained in micro seconds. 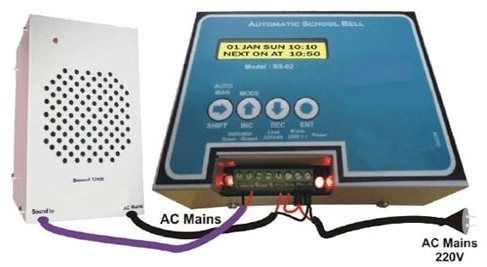 Connect more number of electronic bells: to bring all areas of school in audible range. With one electronic bell 70 to 100 Meter area is covered. Up to 10 electronic gong bells can be connected directly on control unit. All of them will ring simultaneously.